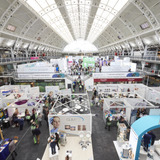 As a relative newcomer to the aesthetics industry, but with 30 years’ experience in the education field, I was bemused by some of the terms attached to learning events in aesthetics. It might sound like a semantic splitting of hairs, but I do believe there is a reason we need to correctly label the education in which we are involved. Unless aesthetics educators make clear what learners are to get from an educational episode, they risk leaving learner expectations unmet and novices engaging in unsafe practice. Correctly labelling what we do allows us to provide a logical structure to our training to ensure that novices develop as quickly and as safely as they can. Education is my catch all term for a wide range of activities wherein someone who is more expert, helps someone who is less expert to develop knowledge, skills or personal attributes relevant to their role. What then are the educational practices I come across in the aesthetics industry? I have attended some excellent sessions: including demonstrations, lectures, skills training and coaching sessions. Aesthetics educators are erudite, knowledgeable, skilful and highly motivated to share their practice with others. I have found the industry to be welcoming, enthusiastic, extremely hard working, and dedicated to sharing and developing expertise. However, I believe that small amendments could be made to the way these sessions are labelled. Seeing something done once on a television screen is not skills training; a presentation on the molecular make up of a new product is not training. Neither of these events will safely equip a newcomer to use the product or practise the procedure in a way which is consistent with an industry looking to achieve high levels of practice. Despite the quality of these sessions, the miss-selling of them as something they are not and the lack of progression between them means they can confuse, or more worryingly claim a level of prowess in the participants that does not exist. So, let’s be more appropriate in the way we label our educational events and sequence them so that novices can progress logically through a recognised system of development. 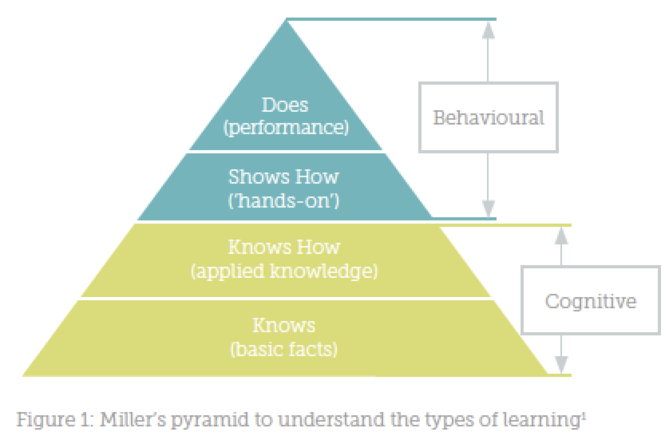 An often-referenced model which is useful across a range of professions within the healthcare setting is Miller’s pyramid (Figure 1).1 This model positions knowledge-based learning and skills-based learning in a logical hierarchy. If we look at each stage of this model from the bottom to the top, we can see that knowledge about a procedure or a product is the foundation of all learning. Understanding the types of learning used at each level, and what a novice will be able to know and do as a result of that learning, is fundamental to ensuring our educational work is most effectively used. Before we begin to learn something new, maybe a product or procedure, we need to have an awareness of it, knowledge about when to use it, what it does, the pitfalls and the risks and benefits. 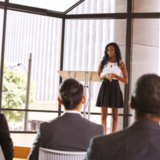 Lectures, presentations at conferences, reading and e-learning are usually the most effective ways of sharing knowledge and ensuring that our learner ‘knows’ when they leave. But this is only the start of the process of developing new aesthetics skills. The second level of the model takes knowledge about something into the realm of knowledge of how to do something. ‘Know how’ involves a learner knowing not just what the product or procedure is, but the practical process involved in its use. So, whilst I might know what a bicycle is, have seen one, have known people with one, and might understand that it is a mode of transport, the ‘know how’ involved in riding one is more than that. Bicycle ‘know how’ might require me to understand the principles of balance, and of moving pedals in a forward motion with both feet, whilst balancing on the two wheels. ‘Know how’ can be developed through watching demonstrations or film clips and hearing experts break down what they are doing into manageable and digestible chunks. But it does not make me able to ride a bicycle. With this analogy, you can now think about how this would apply with a dermal filler injection, for example. So, ‘Know how’ is more than knowledge, it is knowledge as to how to do, but it is not yet doing. 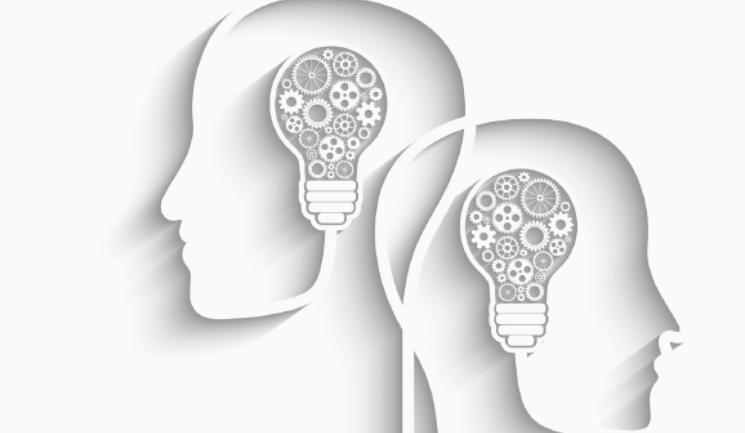 A newcomer ought to begin their practical learning in a supported and structured way, with an expert beside them, who can not only guide their practice, but slow them down, ask them to pause, question them to help them think about what it is they are doing, and to stop them if necessary. One tension in aesthetics is that the patient is most often awake, and as such any learner talk needs to be minimal. With increasingly sophisticated models, or with filmed material, imagination and dedication, the ‘show how’ can occur without a patient being present or with patient models and simulation. The ‘show how’ stage of learning can be undertaken in small groups or on a one-to-one basis, where novices can work with experts in a focused way to practise, discuss and clarify. It is the learner who is showing how – without an opportunity for guided and supported practice, many more mistakes are made. Seeing a demonstration and then performing a procedure on a patient is not effective learning, it is high risk and leaves both the clinician and company exposed. The final part of Miller’s model is the ‘does’ level. At this point, the learner has seen and thought about the procedure or product and understood the indications and contraindications, they have seen a demonstration with commentary and understand the broad approach. With support and guidance, they have practised with a more expert colleague, and when they are comfortable, they can practise alone. 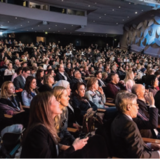 In hospital medicine the initiative, GIRFT (Getting It Right First Time) is gathering momentum, and as a philosophy for education in aesthetics, the phrase is one many would support. Why risk a process of trial and error on a patient without having competently and confidently performed the procedure first? It may take months to feel confident in some new procedures, but a logical progression between hearing about a new product, seeing a demonstration, having supported practice and then performing it safely might reduce the time needed and develop more confidence in the novice. Figure 2 matches the most frequently used educational events to the stages of Miller’s model1 and suggests names for the experts involved in developing the knowledge and skills of the learner. Clearer labelling of the work we do, with explicitly stated learning outcomes would help define what it is we are hoping our colleagues will achieve, and make it clear for them to develop competence and confidence in new areas. We can see here that the practice of lecturing is not actually training, and that demonstrating is also not training. These roles are very important to the layered process of acquiring knowledge and skills, but that it is only when people work together on practical ‘show how’ sessions that training really takes place. If we are to ensure that best industry practices are met, we need to ensure that all levels of this training paradigm are met. In my work as a Train the Trainer facilitator, in conjunction with Dalvi Humzah Aesthetic Training, my colleagues and I encourage trainers to use a range of different educational approaches, and to match the intended learning to the method of education used. If we do advocate using a lecture or a presentation, we stress that the limits of the learning in this approach are knowledge based. If a demonstration is used, in a large meeting, with hundreds watching and perhaps a live link, we need to be realistic that this is going to help to develop ‘know how’, but it does not train an individual how to perform the procedure. In order to ensure that a newcomer can confidently and competently practise a new skill, small group or one-to-one skills’ training or coaching is needed. There is a strong tradition of sharing and developing expertise in the aesthetics industry, and some excellent practice across the world. With some further clarity around what we call our educational interventions and what we hope learners will achieve from them, we can design more logical frameworks to maxmise skill development in our community. Miller, GE. The assessment of clinical skills/competence/ performance. Academic Medicine (1990);65(9):s63-s67.